If you like our restaurant, the greatest compliment you could pay us is to send your family and friends to dine with us. We promise to treat them as you would! 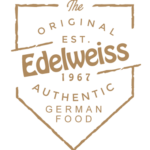 Whether looking for an anniversary gift, an employee or boss gift, something to send in a thank you card, Edelweiss Gift Certificates make the perfect gift. Click the link below to purchase gift certificates. Gift certificates come in $25 denominations. When you select Buy Now, a separate window will open with your shopping cart. Transactions are brokered through PayPal so your Credit Card information is secure. Please note that there are no shipping or handling charges added (ie; a $25 Gift Certificate costs $25).